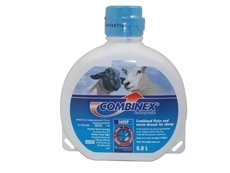 Combination fluke and wormer for the treatment and control of parasitic bronchitis, parasitic gastroenteritis and fasciolosis in sheep. A cream coloured suspension containing 3.75% w/v levamisole hydrochloride and 5% w/v triclabendazole. Legal Category: POM-VPS.